mommy of two | escaped. If you're wondering why there hasn't been any updates in here.. It's because I'm a mommy of two now OMG. When there was only one child, I thought my life was super hectic already - outings are bizarre occasions which happen to be a luxury for us, our movie time was reduced to less than 10 a year because why would you bring a baby to a cinema? Then, two kids happened..and my social life is basically zero. Blogging life too, as evident from the past month. It's been 1 month and a half since I gave birth to Rafiy, making the total of lives dependent on us now to TWO. Let me tell you about my past 1 month and a half. Has been better than the first time Alhamdulillah! I think I mentioned this in previous blog post - VCO and perineal massage helped me a lot, I think. Though for other body parts, I still slather minyak panas every day to help the 'angin' go away and let me have a healthier body and even though I'm technically over pantang period already, I still pantang a few types of food - fully breastfeeding means I'd have to watch what I eat. Or else, I'd suffer. Read next part. If you think you're prepared for the second time after having gone the whole first time experience, YOU'RE WRONG. For the past month, I've been under a lot of stress that I think I've developed PPD somewhat. Rafiy won't sleep at night..without crying his heart out at first, that at times when I'm comforting him I'm asking God why He tested me like this. At times, I even wish Rafiy was a different kind of baby; a good one like his brother. There I said it. You don't understand. Rayyan was relatively a good baby - he fell asleep at night without fussing at all and only woken up a few times for milk. Then he slept until morning and repeated the routine for every few hours, which gave me ample time to do my thing and have me-time. But Rafiy, he'd cry after feedings for God-knows-why, he'd cry while I'm desperately trying to put him to sleep at night, and even after I've successfully made him doze off in my arms, he'd cry again the moment I put him down. Stress? That's an understatement. I'm mentally and physically exhausted. And I realized the worst feeling as a mom is when you can't comfort your own baby when he's crying bloody murder. So for now, the verdict is Rafiy is probably colicky or just having a hard time especially at night (what his pediatrician says), and we'd just have to endure it until this phase goes away by the time he's 3 to 4 months old. When his pediatrician told me this, I cringed - that's like more than 2 months away FML. He was always kissing my belly while I was pregnant, and I'm so glad his loving demeanor doesn't stop even after his little brother was born. He loves Rafiy so much that the first week we had Rafiy at home, he'd cry every day at his school, telling his teachers he wants his adik and Mommy at home. 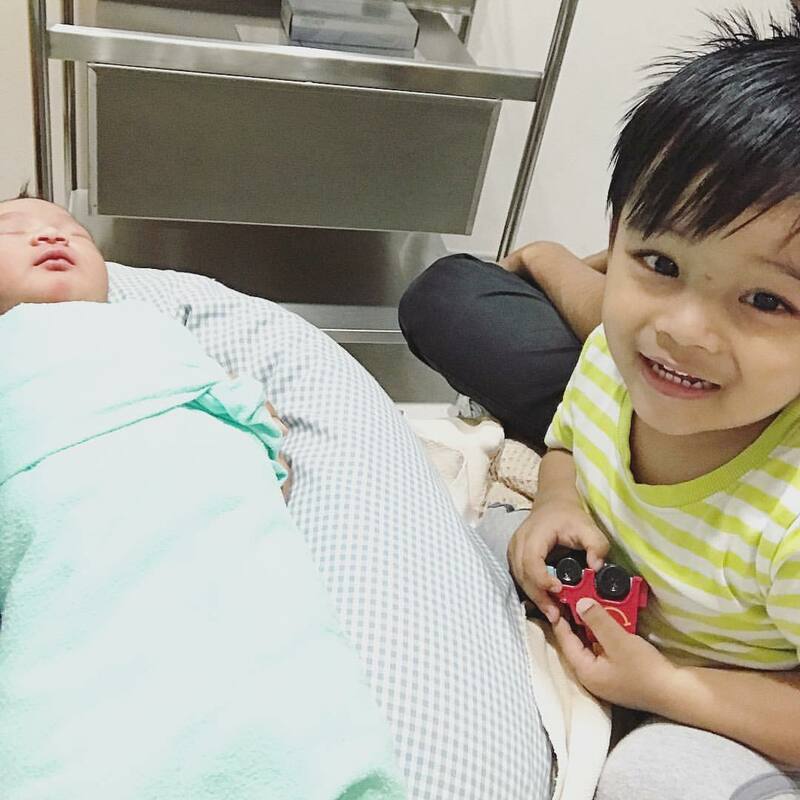 He kisses Rafiy every day after returning from school, he calls Rafiy adik, he caresses Rafiy's cheek and face whenever he sees Rafiy awake, he'd be mad if people touch Rafiy's things and he'd insist on pushing the stroller when Rafiy is in it. Although we know he loves his brother, it's still difficult to manage because toddlers don't know their own strength - sometimes he'd pinch Rafiy's cheek or pat his back a little too hard, and Rafiy would cry. But above all, seeing Rafiy smiles at me for the first time was the best thing that happened to me for these past 1 month and a half. Here's to hoping for better months ahead. and yes, stress is really an understatement...i was worn out, and lethargic..i cried everyday..
Oh God, please give me the courage to have more kids.. Same here T.T I think I'm going to be contented with just 2 kids, considering how depressed I am right now. Pantang certainly isn't helping, nor did breastfeeding (I envy those who don't have to worry about their supplies!) and now..my firstborn is down with HFMD at the moment. My only consolation is that God will make it way easier the third time. Third time's the charm, right? Anyway, thanks for your concern and kind words as always :) Really helped me through this period cause I know I'm not alone. my first baby macam tu, he started crying from 7pm to 12am every night and i developed PPD, thought of dropping him several times until my husband had to rushed back from terengganu (he works there, so am alone with baby). now nk plan for second one pun i hesitate, do u mind if i offer suggestion, go to any jamu shop/kedai yg jual local products tu and buy minyak telon anugerah, i found out after 4 months and when i used it on my son, it helped tremendously, also recite al fatihah, ayat kursi and 3 qul with niat to jauhkan benda2 tak elok and protect ur son from them. hope it helps. 7 pm to 12 am, wow you're really strong to have endured that :( My baby's fussy times vary, but usually at midnight when we're trying to put him to sleep. And yes I think I developed PPD somewhat cause I keep crying whenever this happens and it bothers me a lot to the point I'm terrified of nighttime. Imagine coping with this everyday..
And here I'd like to thank you from the bottom of my heart - I bought the oil (at this point I'd try anything people told me) and it helpssss :) Rafiy has had a few nights of peaceful sleep now! I think the oil smells different from the usual oil sold at grocers and more soothing even to adults. Ada minyak yg too strong to babies I think, which I stopped using too. Forgot the name.